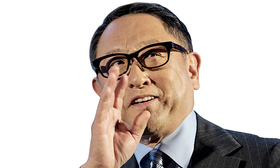 TOYOTA CITY, Japan — Akio Toyoda is wrapping up his first decade at the helm of Japan's largest automaker, and he is likely to keep his hand on the wheel for quite a bit longer. Why? Because he still hasn't found the right person to take over. "From day one of becoming president, I have been always looking for my successor," the Toyota Motor Corp. boss said. "But after 10 years, I find that it is even more difficult to find the right one." Toyoda says he is just getting started on a "full model change" of the company his grandfather founded 82 years ago. His new mission is to create the bedrock of a next-generation carmaker to allow his successor to focus on future mobility from the first day in office. "If I may use an automotive analogy, my mission is to lead the company itself through a full model change," Toyoda said. "By the time I pass the baton to the next president, I hope this cultural reform is complete so they can start sharply focused on the future from day one." Speaking April 10 with Automotive News from his office in Toyota City, the 62-year-old chief said he "will continue for some time" in his current role, reinventing the company. As part of the overhaul, he speculated about someday even changing the company's name from Toyota Motor Corp. to Toyota Mobility Corp.
That will be up to his successor. "That could also happen. But probably not during my time," he said. Such out-of-box thinking is exactly what Toyoda wants to nurture. And he sees himself as having the freedom to force the change. "More important than what's being said is who is saying it," Toyoda said. "As we prepare for this once-in-a-century transformation, sometimes this family name proves quite useful." Toyoda's makeover will focus on three key areas: leveraging Toyota Group companies, building alliances with other automakers, and expanding deeply into artificial intelligence and technology. Toyoda dubs the strategy "Home and Away." It refers to unlocking the strengths of Toyota's vast array of companies while also looking farther afield for new partners and markets. Another novel idea: Spinning off some of the new businesses that are being incubated within Toyota. That notion mirrors the thinking at of Toyoda's grandfather Kiichiro, who started dabbling with automobiles as kind of a pet project inside the family's then-flagship loom- manufacturing empire. Only later, in 1937, did Kiichiro spin off Toyota Motor as its own company. Fast-forward to the present era, and similarly future-looking subsidiaries, such as Toyota Connected, TRI-AD and Admatechs are the spinoff candidates of tomorrow. They too could someday blossom into businesses that rival the size of their parent, he believes, just as Toyota Motor eclipsed what was then known as Toyota Automatic Loom Works, a company that still exists as Toyota Industries Corp., yet is anything but a household name. "When we have those kinds of businesses," Toyoda said, "it would be better to spin them off, rather than try to retain them and grow them within the company." Toyota Connected is the internal company headed by Toyoda confidant Shigeki Tomoyama. It focuses on telematics, digital marketing, smart communities and dealer integration. Its motto: "Free us from the tyranny of technology, making a connected life a more human experience." TRI-AD, short for Toyota Research Institute-Advanced Development, was formed last year with group suppliers Aisin Seiki Co. and Denso Corp. Its mission is making the software needed to run self-driving cars. Its catchphrase is "Silicon Valley agility. Japanese master craftsmanship." Admatechs Co. is a joint venture between Toyota, Shin-Etsu Chemical Corp. and Shin-Etsu Quartz Products Co. that focuses on developing advanced materials for use in computers, electronics, autos, food and medical equipment. Toyoda said his envisioned "full model change" is unlikely to be finished in his generation. Instead, he wants to put the plan in place for his successor to complete. In some respects, Toyoda said, he got off to a late start. After taking office in 2009, he spent the first three years grappling with one crisis after another. It started with the global financial crisis and the company's first operating loss in 70 years. Problems only snowballed with the unintended-acceleration recall debacle. Then came the gut-punch of the 2011 earthquake and tsunami in Japan. The next three years were spent regrouping during Toyota's "intentional pause" on growth. Only in the last couple years, Toyoda said, has he truly turned his focus to the future. Just who might finish the transformation is an open question. Toyoda likely will need to dig deeper than his top lieutenants, who, together with their boss, are known as the "Seven Samurai." Of the six executive vice presidents, only three are younger than Toyoda, and just barely. Tomoyama is 60, while Didier Leroy and Moritaka Yoshida are 61. Indeed, to shake things up, Toyoda last fall wiped out a whole tier of executive posts at the managing officer level, collapsing it with levels below to flatten out the hierarchy. Promotion increasingly will be based on ability and talent, not rote seniority. Toyoda's goal: develop younger talent by giving junior managers a faster path to advancement. Toyoda said the next president might be a man or a woman, and could even be non-Japanese. "I don't care about what school they went to, their gender or their nationality. All that is irrelevant. All I want to know is what they want to do here in this company?" Toyoda said. "This is the kind of culture I want to create."